The new Sharpness lifeboat which has been ordered, at a total cost to the organisation of £128,000, is to replace the aging primary lifeboat which will be taken out of service upon delivery of the new bespoke state-of-the-art lifeboat later this year. 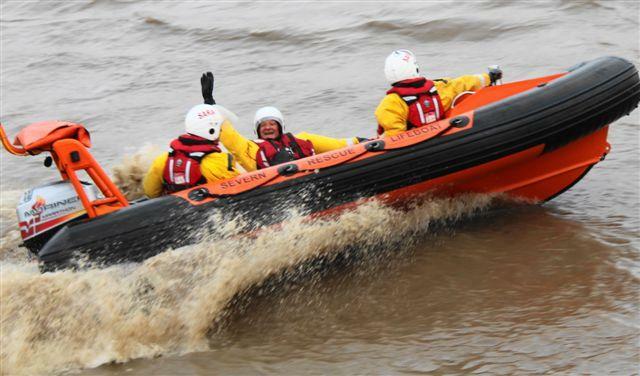 The increase in size of the new lifeboat has identified difficulties in launching it as it will require its own dedicated launch cradle enabling the lifeboat to be directly launched into the Severn from the Keystone Slipway at the lifeboat station. President of Cotswold Tyndale Rotary, Derek Aston, decided to make this his charity mission and to raise the money required for the launch and, through an immense amount of time, effort, activities and hard work has enabled Cotswold Tyndale Rotary to make the donation. For details of the Sharpness Lifeboat Station, which forms part of SARA (Severn Area Rescue Association) click here.